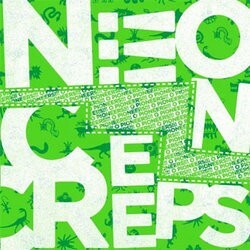 With their Asian Man debut, Neon Creeps, O Pioneers!!! is trying to make a name for themselves while upping the ante on stupid punctuation in band names. What I hear is a sloppy three-piece punk band with hints at a more minimal and sometimes folk-punk style. I call them a three-piece, but the band is clearly Eric Solomons baby, as there has been a rotating rhythm section since the bands inception in 2004, with turnover as recently as the recording of this record. Trail of Dead on The Architect of Disney World, things shift with Dead City Sound. The song sounds like The Riot Before, including its name, but it loses a lot of energy on the breakdowns. Where it differs from The Riot Before is that when the band turns toward a minimal sound there is a focus on the bass and drums, whereas the comparing band tends to use a lot of guitar and strong vocals. Unfortunately, I dont find the content of O Pioneers!!! to be nearly as interesting and it doesnt work very well with such an approach. The delivery in 9 A.M. Everyday and I Have a Major Weightlifting Problem is dreary and repetitive - fitting for the depressed lyrics, but its not easy on the ears either. Several of the songs are sung in a tell-it-as-it-is manner that doesnt really offer any insight. In these, Solomons approach is simple, relatively ugly (his voice isnt exactly pretty), and to the point. Theyre also my least favorite tracks. Things are a little more interesting when they vary their approach, as in the first two songs. The middle is too samey and has trouble maintaining its energy. When you hit the surf-garage intro to I Told You So, the tempo is striking after several lackluster tracks. The lyrics contain a lot of references to moving on, social pressures, managing stress, and that old Ill never fit in theme that appealed to me when I was a Bouncing Souls-listening teenager. The song titles do the long-winded, humorous-but-relevant thing. Generally speaking, I like O Pioneers sound in smaller doses but Neon Creeps is too redundant. Considering the price, this album wouldnt be a bad purchase, but its far from essential and I hope for more consistency in future releases. Posted April 27, 2009, 9:55 a.m.
Posted Dec. 2, 2013, 6:46 p.m.
Posted Sept. 19, 2013, 8:06 a.m.